In which I decry the lack of puppetry interest in NL and am quickly made a big fat liar! While visiting colleagues at Mermaid Theatre last month, Lee Lewis asked me what was happening in puppetry in Newfoundland. I threw up my hands in a kind of exasperated fashion and said, “I think I’m it!” Shortly after returning to western NL, I was invited to join in on a couple of puppetry grant applications, and had several visiting artists drop in to my studio at the Rotary Arts Centre in Corner Brook to discuss their puppetry projects in development and to play with my latest creation. I am in the process of developing a puppetry play for young audiences entitled The Lady of the Falls. I’ve been working on this project with my husband, Michael Rigler, and through a grant from ArtsNL was fortunate to travel to Belgium at the end of the summer to undertake a two-week puppet creation workshop, and then to travel to Mermaid Theatre to work with Jim Morrow and Struan Robertson to finesse the puppet design and discuss my plans for developing the show. I discovered the work of Natacha Belova while looking for content to share on the Unima Atlantic Facebook page. 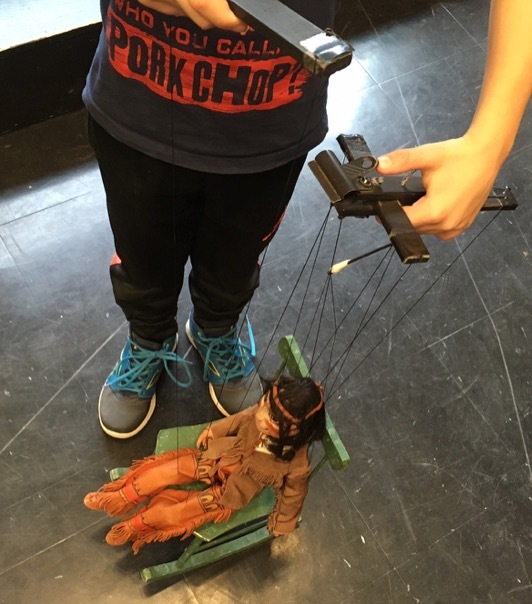 I was enchanted by the life-sized held puppets created in her workshops, by the realistic sculpted faces, and the playful street puppetry students would engage in with their creations at the end of the workshop. Natacha, originally from Russia, is a theatre costumier, sculptor, and marionnetteist based in Brussels, though she offers her creation workshops all over the globe. I joined 16 other artists from all over the world in Brussels where we gathered daily at the Theatre Galafronie in the St. Josse district of Brussels – both the most densely populated and the poorest neighbourhood in all of Europe. It was a wonderful experience! We began by improvising with some of Natacha’s puppets, and then had to create drawings of our designs before beginning to sculpt the heads with clay and then with two layers of thermoplastic. I have neither drawing nor sculpting skills to speak of – so every day was a challenge for me, and yet, with Natacha’s guidance, I succeeded in creating a puppet that I love, and who will be the lead character in our new play. In mid October, I brought my Lady puppet to Mermaid, and Jim Morrow and Struan Robertson helped me change the body design, to give me more freedom to play, allow me to change hands, and to open up possibilities for performance, such as having another puppeteer manipulate her with me. I’m so grateful to have such resources here in my own corner of the world, and hope to spend more time in the loft at Mermaid as we further develop our show. Sara Tilley traveled to Slovenia last year to spend six weeks mentoring with Puppetry artist Darka Elderji. Through this experience, Sara is developing a solo show – Hungry Little Shadow – a tabletop puppet show about homelessness and hunger, based on a Slovenian folk tale, for all ages. Caitlin Bolduc-Whelan is working on an adult hand-and-rod muppet-style show called, Nan’s Kitchen, where artists drop in to play and give interviews. Jake Mupp, a very young man, is currently filming his muppet-style puppet hosted talk show for all ages, which premiers on local Rogers TV St. John’s in January. 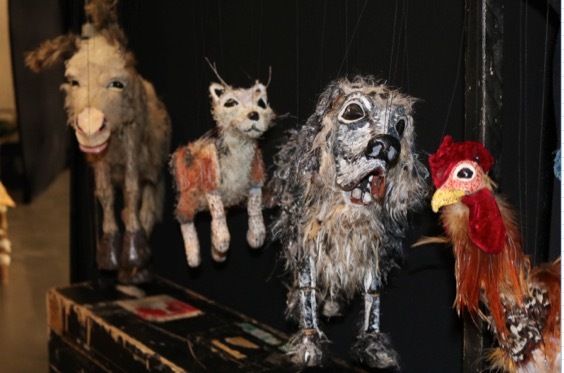 Ruth Lawrence’s company, White Rooster, has a puppetry show in development. Clever Girls: Kate Crackerberry, features the work of Baptiste Neis, and will undergo a second development workshop in December and then be presented by RCA in March 2017. 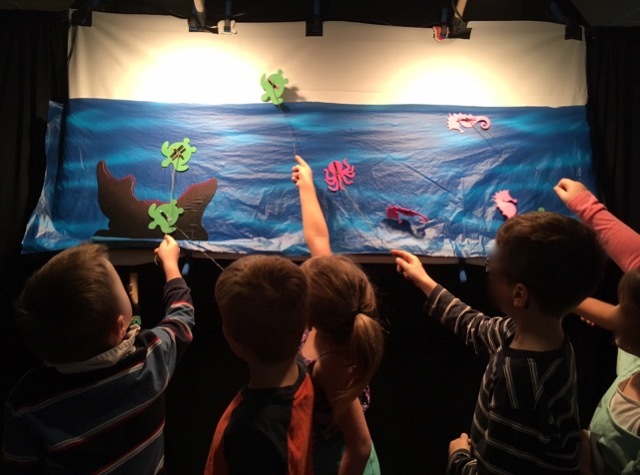 Isle aux Mort’s Theatre Festival is currently developing A Fish Tale: A Puppet Lantern Play, in partnership with Qalipu First Nation to be presented during the summer of 2017. 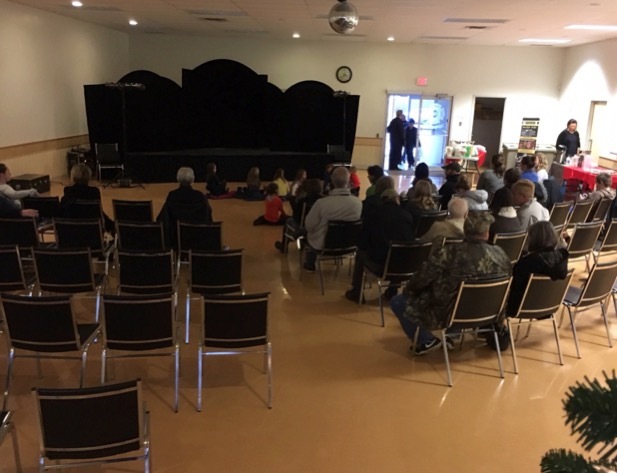 Merci Radarts – Theatre Alacenne était en tournée au mois de novembre avec leur spectacle Ally et la forêt – un spectacle pour la petite enfance de la maternelle à la deuxième année. Elles étaient trois jours à Dartmouth et deux semaines au Nouveau-Brunswick à trois représentations par jour dans les gymnases des écoles élémentaires. Le spectacle est bien reçu. La thématique est le recyclage et le respect de nos forêts! 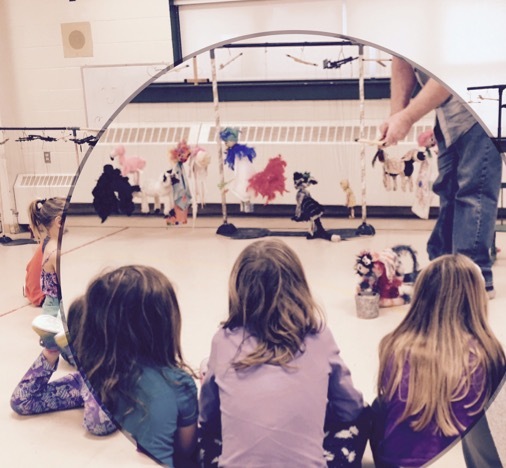 Thanks to Radarts – Theatre Alacenne was on tour most of November with their show Ally et la forêt (en Français)- a puppet play for kindergarten to 2nd grade. They played three days in Dartmouth and two weeks in New Brunswick presenting three shows per day in the elementary schools. The show is well appreciated. The themes are recycling and the respect for our forests! The Mermaid family is delighted that our Artistic Director (and president of UNIMA Atlantic) was recently awarded The Order of Nova Scotia, our Province’s highest honour. Recipients are residents who have made an outstanding contribution to the cultural life or social or economic well-being of the Province and have excelled in any field of endeavour to the benefit of the people of the province or elsewhere. Touring Journal November 21 to 27. All right Puppeteers, here is some news from Maritime Marionettes- a view into the past week on the road. We try to book no more than 4 days straight of touring, this past week was clearly an exception, we worked 7 days straight, whew! 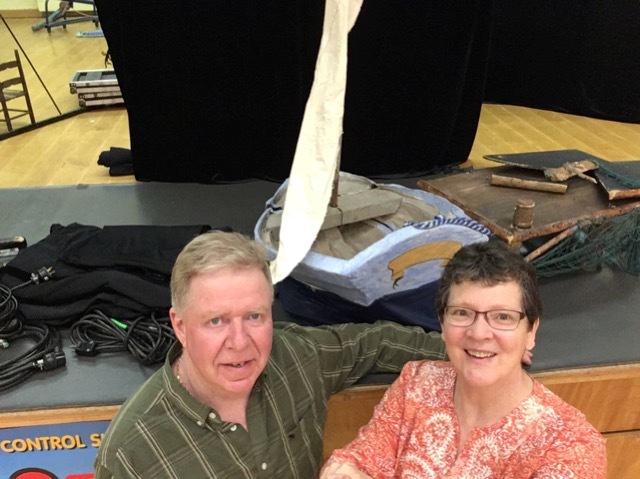 Darryll and Heather, after a performance of Molly and the Oak Island Treasure at Digby Elementary. We performed Molly and the Oak Island Treasure at Digby Elementary and Somerset and District Schools. At both schools we also did workshops with every class at the school. The younger classes have 30 minutes and the older 60 minutes. We spent 3 days at Digby and two days at Somerset. 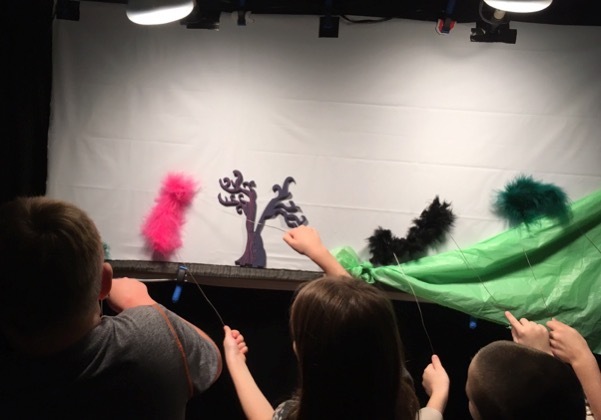 The students from Primary to Grade Six use shadow puppets and marionettes in our workshop. We have been doing this through PERFORM NS (a cost sharing program for the schools with Theatre Nova Scotia). The workshops have been growing and changing over these past three years. We have taken marionettes from shows we have retired and strung them lower so the kids can hold them. It is amazing to watch the children work the puppets, they are so excited to try them. We keep up with the tangles and repairs and for the most part they are very respectful of the puppets. We do lots of fun things in the shadow puppetry part of the workshop: making sound effects for puppets with percussion instruments, and learning to move puppets realistically in different environments. The photos show it best. We came home to Truro, at the end of the week to rehearse our 15 minute Nativity Show, and load it in the van with The Bremen Town Musicians. Saturday night we headed back to the Valley for shows on Sunday in Berwick. 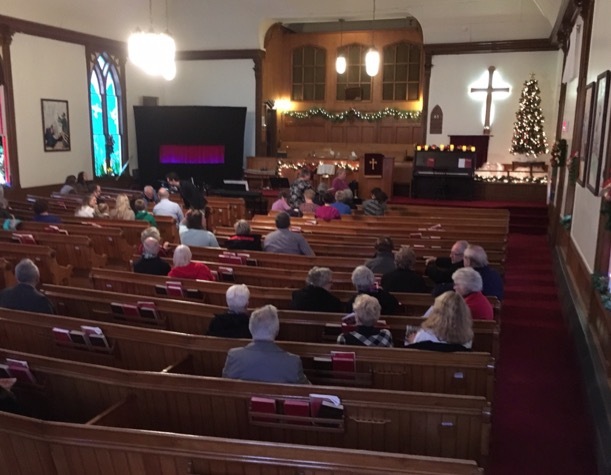 It was a full day, setting up two different stages: one at the Berwick Baptist church and the other at the Berwick Fire Hall. Both shows were sponsored by Meadowbrook Meat Market. The performing was very rewarding, we always love the public shows, and noted that there were more adults than kids at both performances. Sadly, our Nova Scotia school shows, may just be on hold until there is an agreement negotiated for the teachers. Let’s send them all our best wishes for a good outcome. Free shows held on the hour and half hour. 239 Abercrombie Road – Free will offering. Note: The following call for submissions to the journal Puppetry International was recently sent along from Dawn Brandes, the Peer Review Editor for the journal. Guidelines and details are included below if you’re interested. PUPPETRY INTERNATIONAL reaches more than 5,000 puppet theatre performers, sponsors, producers, and enthusiasts. It’s distributed to UNIMA-USA members and is available at specialty newsstands (distributed by Ubiquity Distributors Inc. and Small Changes, Inc.), puppetry centers and festivals throughout the country. It’s distributed to arts councils and UNIMA Centers worldwide! PUPPETRY INTERNATIONAL seeks brief articles (max. 2000 words) for its “Puppetry and Africa” issue. We intend a broad interpretation of the topic and a style that will appeal to general readers with a strong interest in theatre, art, and African culture. We strive to publish at least one double-blind peer-reviewed article per issue. These do not necessarily need to be on the theme of the issue. The peer-reviewed section of Puppetry International aims to explore how the puppet functions dramaturgically, to investigate larger philosophical questions generated in response to puppets and performing objects, and to trace the integral place of puppetry in world performance culture. We especially seek work by scholars who are pioneering new discoveries based on archival, field, or practice-based research and/or who aim to generate fresh theoretical perspectives on how humans interact with objects in performance. Submissions for peer review should follow the same length (2,000 words, including notes and bibliography) and style restrictions (MLA) as all other articles, but should demonstrate scholarly rigor and original research while remaining accessible to a broad readership. Longer versions of these articles can be published on our website. Peer-review submissions should be emailed to peer-review editor Dawn Tracy Brandes (Dawn.Brandes@ukings.ca) and to general editor Andrew Periale (aperiale@gmail.com). book reviews to John Bell john.bell.puppeteer@gmail.com. Word documents preferred. For All Submissions – NOTA BENE! Subject line on email: PI 41, author’s last name, key word(s) from title. NO FORMATTING (no columns, embedded images, exotic fonts, different sizes of text, etc. ), please. Please note: While we generally publish new, original writing, we occasionally accept translations of previously published articles if they have not yet appeared in English. The Union Internationale de la Marionnette (UNIMA) is the oldest international theatre organization in the world with 6000 members in 100 countries. The organization represents an incredibly strong and diverse network of passionate artists, researchers and educators working in over 100 countries. Every four years, representatives from member countries convene for the congress and World Puppetry Festival – the 2020 event will take place in the Gianyar regency of Bali, Indonesia. Mark your calendars! This entry was posted in Journal, Update and tagged ACPA, Association des marionnettistes du Canada atlantique, Mermaid Theatre, puppetry, Shadowy Souls, Theatre Alacenne, UNIMA, UNIMA Atlantic. Bookmark the permalink.